Northern League football between Washington FC (navy) and Jarrow FC, played at Nissan Sports Centre. Assistant manager Stu Gooden believes that Ryhope CW are “back on track” after their 3-1 home win against Guisborough Town. Gooden’s side actually fell behind to a Nathan Steel goal, but a Michael Rae brace and a goal from James Ellis helped them secure a valuable three points. Ryhope’s recent upturn in form had been ended by consecutive defeats against North Shields and Consett. 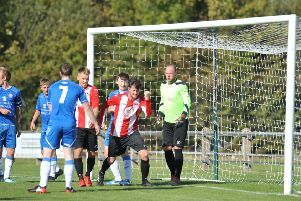 But Saturday’s result against the Priorymen made it four wins in six games for Ryhope and that left Gooden to target another positive run of form. He said “I am very happy with the performance on Saturday and it’s one that gets us back on track. “I felt from the moment they went ahead, there was only going to be one winner. “We played really well in spells and we were comfortable winners in the end. Sunderland RCA moved up to second in the table with a 2-1 win at Bishop Auckland. Nathan O’Neill put RCA ahead, but the sides went into the interval on level-terms thanks to a goal from Andrew Johnson. But O’Neill had the final say as his injury-time goal gave his side all three points and only an inferior goal difference keeps them behind leaders Consett. Manager Martin Swailes admitted that in the past he would have taken a draw at Heritage Park, but praised his side’s desire to go and win the game. Swailes said: “It’s a very tough place to go and they are great going forward. It was a hard win and I think a draw might have been a fair result. “Sometimes you get them and sometimes you don’t, it went for us this time. “I don’t think we will have a runaway club in the league this year, everyone is capable of beating everyone. “The lads were hurting after the recent defeats, but the character on Saturday showed what they are about. Seaham Red Star dropped to second from bottom in the table after a 3-1 defeat at Ashington. Dan Wilson continued his impressive start to life with Red Star when he got them back on level-terms after Chris Youldon fired Ashington in front on nine minutes. But the hosts took the points thanks to goals from Gerard Richardson and Jack Butler and left Red Star with only Penrith beneath them in the table. Consett moved to the top of the table as four goals from Michael Sweet helped them to a 4-3 home win against West Auckland Town. Hebburn Town dropped to third after a surprise home defeat against Whitley Bay. Peter Glen-Ravenhill put the Bay ahead in the opening-stages, but that lead was wiped out by Michael Richardson’s equaliser on 25 minutes. That was as good as it got for the Hornets as second-half goals from Oliver Martin, Jack Foalle and Gavin Caines gave the visitors an impressive three points. 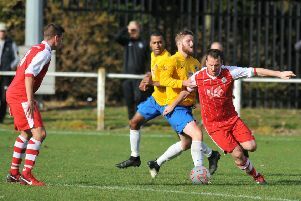 Nathan Mulligan scored four second-half goals to help Stockton Town to an 8-0 win over Penrith, while Newcastle Benfield caretaker manager Paul Brayson got off to a fine start in his first game in temporary charge by scoring in their 3-0 win against Newton Aycliffe. Mark Doninger continued his impressive start to life at Whickham as his equaliser earned them a point in their 1-1 home draw against North Shields. The story of the Northern League weekend came at the UTS Stadium where goals from Liam Brooks and Andrew Grant-Soulsby, coupled with a brace from Mark Fitzpatrick, gave Dunston UTS a 4-3 win over National League North club Chester in the Third Qualifying Round of the FA Cup.